These Chips were thicker than the standard Chips of this flavor in Utz's range. They did not however have the hard, firm crunch of a Kettle Chip. These crunched well at first, but quickly turned mushy. 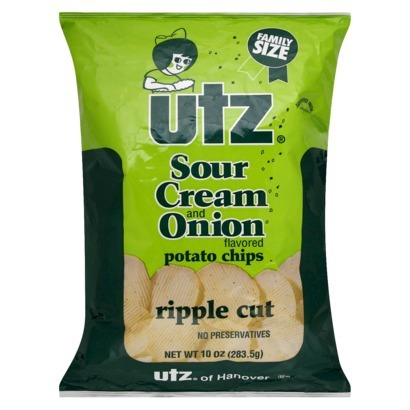 These Chips had thin Ridges that Utz call Ripples. This immediately gave them more character than the regular cut Chips. Although they were similar in color. They had a little browning here and there, and a fairly thick coating of white powdery seasoning. There were also a few green flecks on the Chips. A Nose Plunge Test revealed an Onion aroma. Not much, but it was apparent. The Sour Cream was also noticeable in what were well balanced Chips. Both flavors in the combo were noticeable, but the taste was very mild. Almost as if it were not completely committed to the job at hand.